This is Part 4: Choose Design Patterns and Sketch Out a Story. Introductory post: UX Design Life-cycle, A Mini-Series. Innovative products demand a next-gen user experience. But next-gen doesn’t mean unrecognizable. It’s the reason that the first computer with a graphic user interface contained a ‘desktop’. 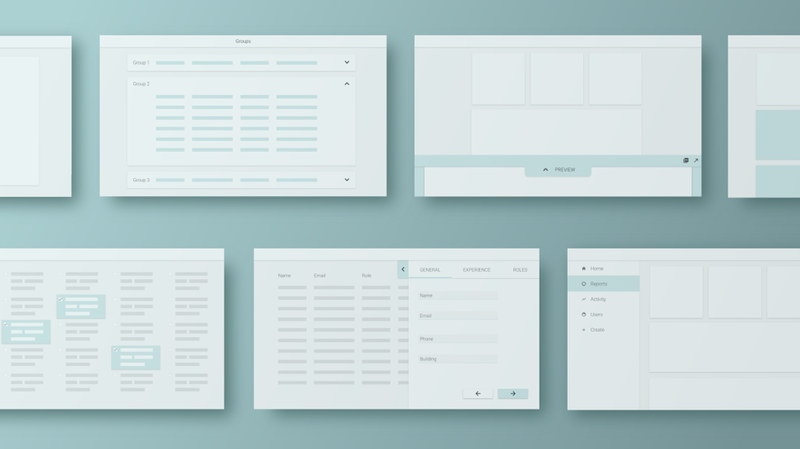 The label pulled on the user’s formed expectations about the physical desktop uses–a space for working, organizing, and providing easy access–and applies them to the digital. A digital workflow pattern emerges around those expectations. This special balance of meeting expectations while reorganizing workflows creates successful and innovative UX experiences. Looking back over our 15 years in business, we’ve worked with clients across many backgrounds. We built out-of-the-box and management systems for enterprise storage. We dove into social media and developed a voice-over app for photo sharing. We tackled clinical trial patient registration and documentation in the health sector. We connected job candidates to their background screening progress. We received a patent on our work with a commercial router. It’s a diverse mix. However, across all of our projects, we leaned on a handful of design patterns to organize information and move the user towards the main success scenario. Recognizing these patterns allowed us to create a faster, clearer framework for iteration. These reusable design patterns are more than visual templates, they are tested human interaction models. They slash time required to assemble early versions of your digital story. Read: your project timeline moves faster, in a more reliable way. These patterns succeed because, like the desktop, they play to the expectations that people form based on past experiences. By following the principle of least astonishment, they serve as the ‘familiar’ counterweight to the ‘innovative’ side of design, helping to strike the balance of usability. Armed with our design patterns, we’re able to create a framework for organizing and navigating between complex workflows. Then, we begin to sketch out a story using quick sketch-style wireframes to fill in the details and test out ideas. This allows us to provide clients with an early preview so they can give candid feedback. Sometimes feedback may be collected from customers and real end-users or is limited to internal stakeholders. There is a place for each. Using the chosen patterns, start filling in the details by sketching out a happy path story. Sketches can be done by hand or via tablet. Draw out general steps of the workflow, without committing too much detail. Quick is key. Collect feedback from the users, reiterate, and repeat. Rapidly test and reset course early as needed. 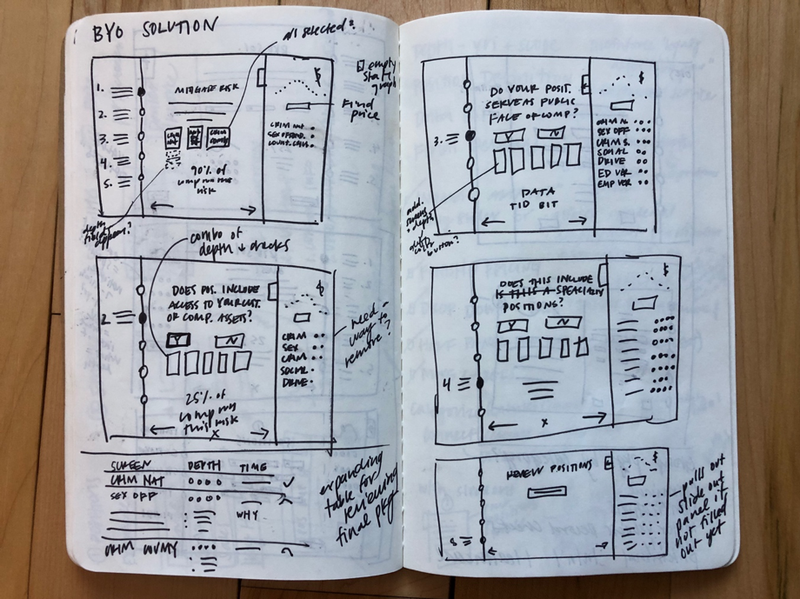 Using patterns and sketching a story doesn’t just help the process move faster, the client also begins to envision their product faster. The iterations work to level the scale between meeting expectations and providing an innovative, next-gen user experience. In our upcoming post, Part 5, Establish a Visual Language, we will demonstrate going from patterns and sketches to a high-fidelity visual language, which establishes visual cues used across the entire application or system.